While working as a full-time digital marketing strategist, I learned many things in the process. 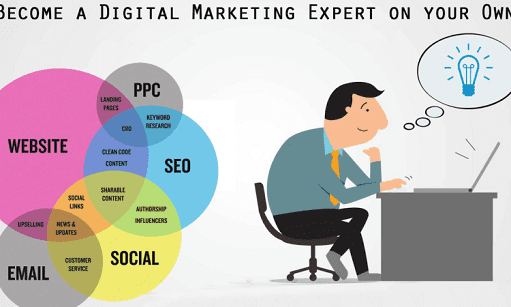 Digital marketing job is not for the people who don’t believe upgrading themselves on a day to day basis. Digital marketing is the job where you find new information every day, new changes are happening all over the web, things are changing rapidly in the digital world. The average person who is not active enough to learn faster will find a hard time to stay in focus around the digital realm. These are things I have observed while working for several companies in my career. The digital marketing expert must keep 2-3 spare hours for everyday reading. Read blogs, case studies or check the business news to understand how industries are growing. The digital marketing is the backbone of the company’s success. By looking at companies marketing campaign you can try to reverse engineer the tactic to find the strategy they are using to grow. These businesses have found some marketing hack which is working best for them. So when you become a digital marketing strategist, your job is to keep a close eye on the changing market and learn faster to adopt the new technology. In digital marketing, the execution plays a critical role in generating results. Without proper execution, your strategy will never work. I have seen many experts who are best in creating ideas, but their execution part keeps them behind the faster-changing industry. They find a hard time to cope up with the new technology. Your marketing ideas should be executed on a priority basis to experience the positive result. Everything is assumption until you see the real data in front of you. 80% of your energy should be given to the execution and 20% for creative ideas. Your time management skill should be good if you want to become a digital marketing expert. Your customers are busy. They will not entertain your marketing content at any time of the day. The campaign that you are running should be designed to give a good experience to your client. For instance, emails are read in the morning between 10 to 12 am. After that people get busy in other stuff and they try to avoid accessing their email id. Your marketing campaign will not work if you send them an email at any time in a day. The success of email marketing campaign also depends on the regional holidays. Keep the calendar handy to see the upcoming festivals and public holidays. Your email marketing campaign will fail if it is not planned well. In essence, the timing is important in digital marketing. Your campaign should be time bound. You must have a vision how it will end up after you complete your execution. The big mistake that digital marketing expert do is they don’t record the base numbers. Whenever you are going to run the marketing campaign, you first record base numbers in the marketing spreadsheet. It will tell you how much you are growing day by day from the marketing. It will also give you heads up if the things are not going well. The numbers are the ultimate source of tracking the success of your marketing campaign. Although not all the marketing campaign will end with the positive result. Your failure will give you a perspective of your execution plan. You will have something in hand which will help you to create next marketing plan without doing the same mistake again. You can present this data to your boss to showcase the progress of your digital marketing campaign. I believe every digital marketing strategist should have decent writing skill. If you don’t have the skill then start learning from today. Digital marketing expert should spend writing at least 1000 words of article every day. Write blog, article or share advice on a certain topic on social publishing sites. Social sharing website like medium.com allows users to share their thoughts with the online community. Your published article will be accessible by online users all around the world. The digital marketing is all about spreading the message about your brand. The message that you are promoting should be creative enough to capture the attention of the users. If you are not a writer then chances are you will lack creative touch in the marketing campaign. No one is interested reading generalise messages. People interact with the messages that deliver some kind of value to them. I have kept this point at the end because most of the people think creative is very important for making any digital marketing campaign successful. At some extent it is important but that doesn’t mean you spend all your months in finding creative ideas. You can avoid spending much time on a creative idea by observing similar brand in your niche. See how they run their campaign and try to understand which post is generating more traction to them. This is how you create content that will work best for your brand. The word creativity seems over-hyped in the marketing industry. There are many examples of the marketing campaign where content is stolen from the international market and used in the local market by just making few modifications to it. In digital marketing, you do not need to spend much time thinking about creative ideas. First, focus on what is working in the industry and execute it. Once you have all your tactics in place then you can start thinking about the creative ideas. I have seen many people who spend months to think about creative marketing idea and nothing comes out after wasting the time. In marketing, everything is assumption until you have tried the thing in the real world. The data will speak how successful you are at the end of the campaign. so focus on execution and make your time worth. Digital marketing industry is growing faster with the new technology. Data processing technique, demand for the digital content like videos, graphics are in buzz now a day. There will be something else in the future so make yourself aware about the changing digital environment. Hold an eye on the industry to keep yourself updated. Let me know what are the other things that you think are important to become a digital marketing expert.